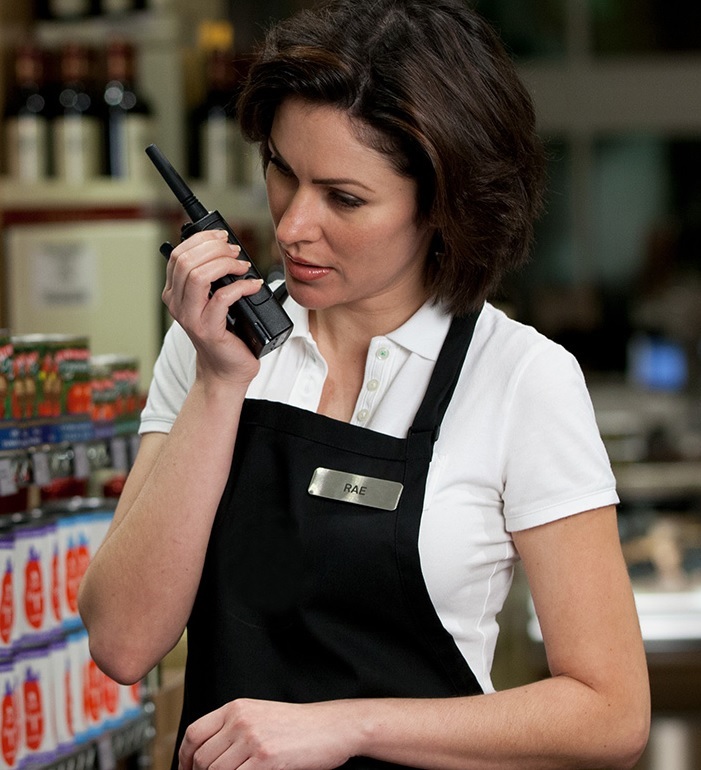 Motorola’s DTR650 Onsite digital two-way radio is helping retailers communicate better. Why is this important? In a recent survey of retail managers, one of the top areas to improve customer satisfaction was reliable two way radio communication between staff and managers. When everybody is in the loop, issues can be resolved more quickly, or even avoided altogether, more easily than when communication is scattered or inconsistent. The DTR650 keeps your workforce connected with enhanced in-building coverage, loud, clear audio and no monthly fees or contracts. It delivers all the benefits of digital at an exceptional value. What are some of the key features of the DTR650 Motorola two way radios? Up to 350,000 square feet of coverage, whether in a building or outside in a parking lot or warehouse yard. That is equal over 10 football fields of coverage. 10 pre-programmed text messages such as “Call you back in 5 minutes,” for when customer needs and other issues demand your full attention. DTR650 radios will be setup to work when they arrive at your location, but if you need to update or change the programming in the field, it is very easy to do. Extra-long battery life: the unit’s lithium-ion battery provides up to 19 hours of operation on a full charge, so there’s no need to worry about losing power in the middle of the day. Rugged but comfortable housing along with extremely lightweight and portable design. Full-graphic backlit display, contrast adjustment, backlight timer, and battery gauge. This radio has the potential to change the way retailers operate – it’s a dream product for industries that need flexibility in communication. You can have a private one-on-one call with a single employee or talk to many at once. This allows you to communicate across different departments and get questions answered far more quickly than if you had to call each one individually – improving customer satisfaction. Workers are able to easily communicate with their managerial staff, which cuts down on the time it takes to respond to customer requests and inquiries they can’t handle on their own. Efficient, friendly customer service creates happy customers, who are more likely to be repeat customers and recommend your business to others. With a large radio area coverage area, the DTR650 can handle the job. The in-building coverage is one of the most impressive features of this radio – one of our customers asserts that he’s even tested them successfully in the Empire State Building! Even in the largest mall, department store, or warehouse, you’ll never have to worry about losing coverage. The radios operate on a 900 MHz ISM spectrum, which is unique to the device, making your communications totally private and secure. Not only that, there are no permits or licenses required to use the Motorola DTR650, so getting set up is simple and there are no monthly or per-minute charges. For our customers who just need to make their communications more efficient quickly and affordably, this radio is an uncomplicated option that delivers everything it promises. Effective communication is important in any industry, but in retail it can make the difference between a lost customer and a repeat sale. Contact us for more information on how the Motorola DTR650 can improve the quality of your customer service and make your entire operation more efficient.